The Kodály method, also referred to as the Kodály concept, is an approach to music education developed in Hungary during the mid-twentieth century by Zoltán Kodály. His philosophy of education served as inspiration for the method, which was then developed over a number of years by his associates. In 2016, the method was inscribed as a UNESCO Intangible Cultural Heritage. The Kodály method incorporates rhythm syllables similar to those created by nineteenth-century French theoretician Emile-Joseph Chêvé. :158 In this system, note values are assigned specific syllables that express their durations. For example, quarter notes are expressed by the syllable ta while eighth note pairs are expressed using the syllables ti-ti. Larger note values are expressed by extending ta to become ta-a or "ta-o" (half note), ta-a-a or "ta-o-o" (dotted half note), and ta-a-a-a or "ta-o-o-o" (whole note). :159 These syllables are then used when sight-reading or otherwise performing rhythms. Scale degrees are introduced in accordance with child-developmental patterns. The first Kodály exercise books were based on the diatonic scale,:3 but educators soon found that children struggled to sing half steps in tune and to navigate within such a wide range. :11 It is thus that the pentatonic scale came to be used as a sort of stepping stone. :9–10 Revised Kodály exercises begin with the minor third (mi-so) and then, one at a time, add la, do, and re. Only after children become comfortable with these pitches are fa and ti introduced, a much simpler feat when taught in relation to the already established pentatonic scale. :12 Kodály stated that each nation should create its own melodic sequence based upon its own folk music. 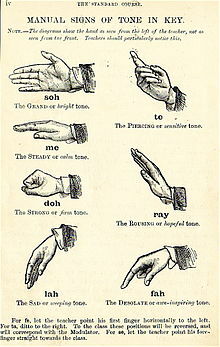 Hand signs, also borrowed from the teachings of Curwen, are performed during singing exercises to provide a visual aid. :156 This technique assigns to each scale degree a hand sign that shows its particular tonal function. For example, do, mi, and so are stable in appearance, whereas fa and ti point in the direction of mi and do, respectively. Likewise, the hand sign for re suggests motion to do, and that of la to so. Kodály added to Curwen’s hand signs upward/downward movement, allowing children to actually see the height or depth of the pitch. :15 The signs are made in front of the body, with do falling about at waist level and la at eye level. Their distance in space corresponds with the size of the interval they represent. :14 In 2016, computer scientists at Northwestern University invented an instrument which is controlled by the hand signs, facilitating their learning. The hand signs were featured in the 1977 film, Close Encounters of the Third Kind. Kodály collected, composed, and arranged a large number of works for pedagogical use:83 Along with Béla Bartók and other associates, Kodály collected and published six volumes of Hungarian folk music, including over one thousand children’s songs. Much of this literature was used in Kodály method song books and textbooks. :15 High quality music was needed in short and simple forms in order to bridge the gap between folk music and classical works. :2 For this purpose, Kodály composed thousands of songs and sight-singing exercises, making up sixteen educational publications, six of which contain multiple volumes of over one hundred exercises each. :69 Kodály’s complete pedagogical works are published collectively by Boosey & Hawkes as The Kodály Choral Method. ^ "Komoly magyar siker: a Kodály-módszer mostantól része a világ szellemi örökségének" (in Hungarian). 24.hu. 2 December 2016. Retrieved 5 December 2016. ^ a b c d e f g h i Mícheál Houlahan, Philip Tacka. (2015). Kodály Today: A Cognitive Approach to Elementary Music Education Inspired by the Kodály Concept. Oxford; New York: Oxford University Press. ^ L. Dobszay (1972). The Kodaly Method and Its Musical Basis. Studia Musicologica Academiae Scientiarum Hungaricae 14 (1/4): 15-33. (subscription required). ^ a b c László Eösze, trans. István Farkas and Gyula Gulyás (1962). Zoltán Kodály: His Life and Work. London: Collet’s. ^ a b c d e f g h Beth Landis (1972). The Eclectic Curriculum in American Music Education: Contributions of Dalcroze, Kodaly, and Orff. Washington: Music Educators National Conference. ^ Geoffry Russell-Smith (November 1967). Introducing Kodaly Principles into Elementary Teaching. Music Educators Journal 54 (3): 43–46. (subscription required). ^ a b c d e f g h i j k l m n o p q Lois Choksy (1999). The Kodály Method I: Comprehensive Music Education. Upper Saddle River, New Jersey: Prentice-Hall. ^ a b c d Lois Choksy (1981). The Kodály Context: Creating an Environment for Musical Learning. Englewood Cliffs, New Jersey: Prentice-Hall. ^ a b Lawrence Wheeler (1985). Orff and Kodaly: Adapted for the Elementary School, third edition. Dubuque, Iowa: Wm. C. Brown. ^ Hong, Matt H. Y.; Hicks, William S.; Horn, Michael S. (7 May 2016). "MiLa". MiLa: An Audiovisual Instrument for Learning the Curwen Hand Signs. ACM. pp. 1691–1697. doi:10.1145/2851581.2892357. ISBN 9781450340823 – via dl.acm.org. ^ Percy Young (1964). Zoltán Kodály: A Hungarian Musician. London: Ernest Benn. ^ László Eösze, Mícheál Houlahan, Philip Tacka (2001). Kodály, Zoltán. Grove Music Online. Oxford: Oxford University Press. doi:10.1093/gmo/9781561592630.article.15246. (subscription required). ^ a b Peter DeVries (November 2001). Reevaluating Common Kodaly Practices. Music Educators Journal 88 (3): 24-27. (subscription required). Mícheál Houlahan, Philip Tacka (1998). Zoltán Kodály: A Guide to Research. New York: Rutledge Publishing. Zoltán Kodály (1965). Let Us Sing Correctly. London: Boosey & Hawkes, 1965. ——— (1965). 333 Elementary Exercises. London: Boosey & Hawkes. ——— , trans. Lily Halápy and Fred Macnicol (1974). The Selected Writings of Zoltán Kodály. London: Boosey & Hawkes. Patricia K. Shehan (February 1986). Major Approaches to Music Education: An Account of Method. Music Educator’s Journal 72 (6): 26–31. Douglas Turpin (February 1986). Kodaly, Dalcroze, Orff, and Suzuki: Application in the Secondary Schools. Music Educators Journal 72 (6): 56–59.